Getting Started - 2 Great Options! 4 Private lessons - These are tailored around your interests, your pace, your schedule and your particular needs. 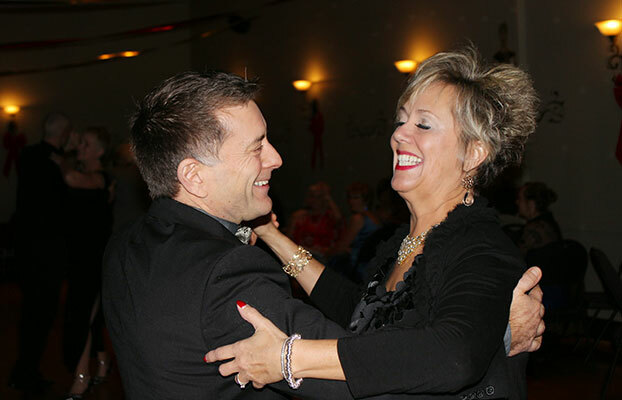 Private lessons ensure you get the best possible start to your dancing journey. 4 Group lessons - Our 4 week Intro classes will review some of things you're learning in your privates, expand into new dances and techniques, and give you a chance to try out your dancing with a variety of partners. 4 Practice parties - Your chance to take your dancing onto a real, social dance floor. This is where you get to put your dancing into practice with new and experienced students as well as other instructors! Privates, Groups and Parties are the 3 pillars of all successful dance programs and we use them in combination to maximize your learning. Featuring 6 of the most popular ballroom and latin dances, these classes introduce you to the basic steps you need to 'survive' on the dance-floor. You won't be a pro after these classes, but you will have a sense for the "feel" of each dance, and you will have enough material to be able to last, ahem, dance, through an entire song! Each class has 4 hours of instruction taught over four consecutive Tuesdays. Check out our calendar for the next start dates. Classes begin every four weeks so if you missed the current set, you can still get started soon. Or if you're getting ready for a cruise or a special occasion, or just plain can't wait to get started, we'll be happy to take you on with our private lesson program. What happens next? Bronze 1! Or, if you'd like to build a really solid foundation, you can repeat the introductory classes (or any class for that matter) for a discounted rate (25% off 1st repeat, 50% off 2nd). Like any learned skill, good dancing comes through repetition. The more you see, hear and do dancing, the better dancer you will become! "I came to Dancing for Dessert with a need to learn to dance, but without a belief that is was possible... The structure of the 4/4/4 dance lessons was exactly what I needed to build my belief. The private and group lessons all worked in harmony with the dance parties to teach and apply what I had learned. The private lessons gave me the close attention I needed to learn the basic steps of each dance. The group lessons gave me an opportunity to practice with other partners, who were also learning the basic steps in private lessons. In the end, the dance parties were a huge step out of my comfort zone, but definitely valuable in learning to dance in a community. It must also be said that my interaction with all the instructors and fellow students at Dancing for Dessert has been an overwhelmingly positive experience. I am now confidently looking forward to dancing with my daughter at her wedding. Thank you for making this possible! I highly recommend Dancing for Dessert for everyone who is desiring to dance. I have learned that life is truly more enjoyable, when you are willing to dance to its rhythm."